This article describes how Miradore Online users can enable/disable two-factor authentication for their Miradore Online accounts. Miradore Online implements TOTP to provide two-factor authentication. 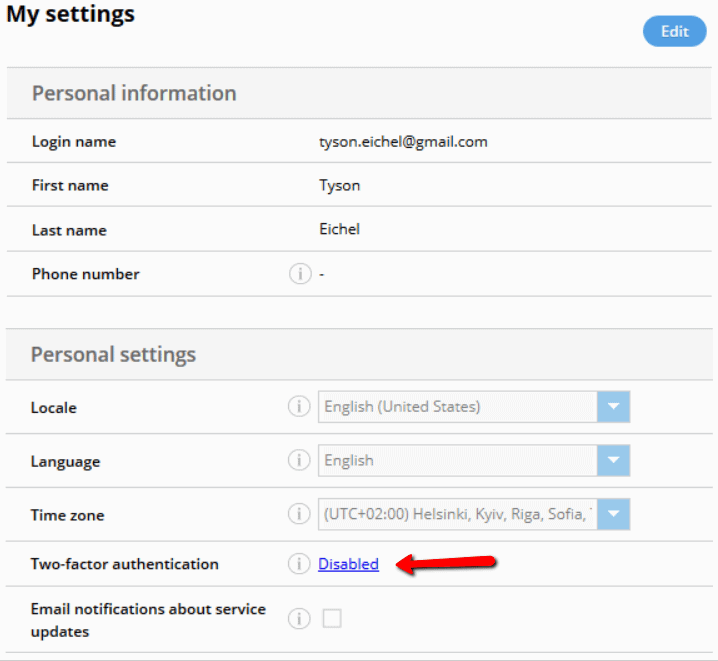 Notice that users cannot disable the two-factor authentication if Miradore Online site administrator has made the two-factor authentication mandatory for all users on that site. Click your account menu (user icon ) on upper right corner of the screen and select My settings. Click Enable two-factor authentication action from the page action menu. Read the provided QR code with your authenticator app to add your Miradore Online account to the authenticator. If the chosen authenticator does not support reading barcodes you can input the provided code directly to the app. You can use, for example Google Authenticator or Microsoft Authenticator, as your authentication app. Then enter the authentication code from your authentication app, your account's current password and click Enable to enable two factor authentication. After that the authenticator generated authentication code is required each time you login to your Miradore Online account. Click your account menu (user icon ) on upper right corner of the screen and select My settings. Click Disable two factor authentication action from the page action menu. Then input your current password and the generated authentication code from the app. Click Disable to remove two factor authentication from your account. Once enabled an authenticator generated authentication code is required each time you login to your Miradore Online account. If you lose your phone or authenticator start Lost your authenticator? during login. Then input your Miradore Online account login name (email) and follow the instructions. You will receive a link to your email address where you can remove the authenticator and disable it from your account.